The Angriest: Star Trek: Voyager: "Innocence"
It is 8 April 1996, and time for another episode of Star Trek: Voyager. 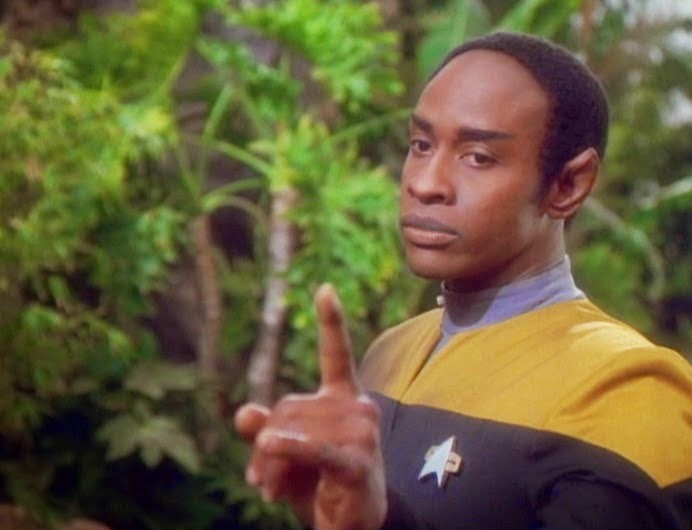 Lt Tuvok (Tim Russ) crashes his shuttlecraft on an unexplored forest planet - only to discover a small group of young children marooned there as well. While he protects them from what they claim is an invisible monster, back on Voyager Captain Janeway (Kate Mulgrew) attempts to make first contact with the alien Drayans. "Innocence" is a surprising episode in many respects. It starts off in a pretty risible fashion, and then somehow manages to pivot into something rather touching and effective, only to swing back once more with one of the more irritating endings to a Star Trek episode. What's a viewer to do? The opening premise is not an appealing one, trapping Tuvok for an episode with several earnest Hollywood-style children. They grate on the nerves from the outset. 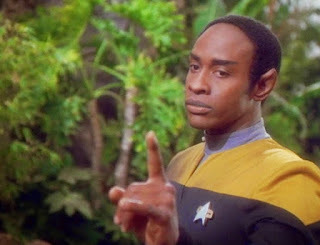 The weird thing is, once the episode settles down it actually allows the script to explore just how Vulcans behave as parents - and how Tuvok in particular does it. It's an unexpected character insight that seems to make the episode worthwhile for a solid half-hour. The children are Drayans, just like the adults that meet with Janeway and tour Voyager. This creates an unexpected wrinkle, because the adult Drayans seem perfectly civilized yet the children claim they have been left on the planet to die. Reconciling these two contrasting situations raise the tension considerably - particularly because there does not seem an easy explanation for the episode to wave it all away at the end. And then that explanation comes, and it's jaw-droppingly stupid. Look away now if you honestly want to watch the episode in future, but it is revealed that the Drayans age backwards. We never learn what they look like at birth, but as they become elderly they shrink in size, their skin smooths out, and their senility makes them act like human children. They have been left on the planet effectively as a form of euthanasia. It's a terrible idea, and ridiculous even by Star Trek's often shaky scientific standards, and really does make you throw your hands up and walk away. It's a pity. The episode was actually okay for a section in the middle. 13 good episodes out of 22 gives Season 2 a quality ratio of 59 per cent.